If cross stitching sends you loopy with joy then a Cross Stitch Crazy subscription is just what the doctor ordered. 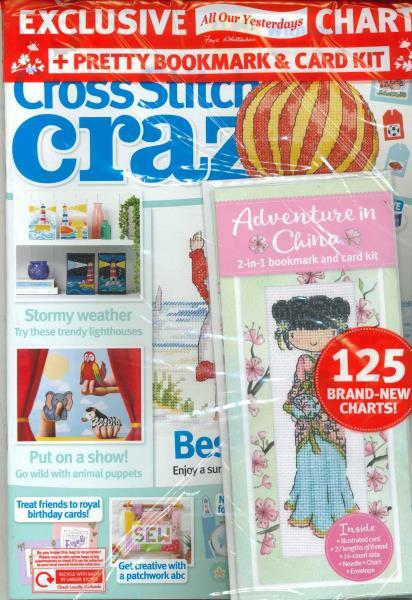 Buy a single copy or subscription to Cross Stitch Crazy magazine. Whether you are an experienced cross stitcher or attempting to cross stitch for the very first time let a magazine subscription help you know your backstitch from your feathered chain, and enjoy all that cross stitching has to offer. All that is required is a needle, a thread, and a copy of Cross Stitch Crazy magazine. Each issue is full to bursting with fun projects and technical how-to guides aimed at inspiring and engaging the reader, making cross stitching accessible to anyone and everyone. There are also enjoyable articles bringing the reader the latest news and must-have products from the world of cross stitching. Not forgetting that each issue comes with expert advice, helpful tips, entertaining competitions, and an exclusive free gift! It’s easy to see why readers of Cross Stitch Crazy magazine are crazy about cross stitching.